(MENAFN - Newswire.com LLC) ANN ARBOR, Michigan, March 25, 2019 (Newswire.com) - As an esteemed Italian fine jewelry brand, Officina Bernardi combines modern jewelry-making technology with the Italian traditions that founders Carlo and Francesco Bernardi learned in their early days. Recently the brand released their spring fashion line, the Moon collection, further showcasing the attention to detail they put into each and every piece that leaves their studio. Officina Bernardi's signature detail is the Moon sphere, a perfect globe of precious metal engineered to sparkle just like a diamond does. In the Moon collection, this detail takes center stage -- each piece from this line is comprised almost entirely of Moon spheres in 925 sterling silver and gold plate. The jewelry in this collection pays homage to the beauty of the titular celestial orb, and the master jewelers at Officina Bernardi capture its essence perfectly. Find Officina Bernardi 's Moon collection and more at Lewis Jewelers, the premier fine jewelry retailer for Ann Arbor and beyond. Pieces start at $45 and up. 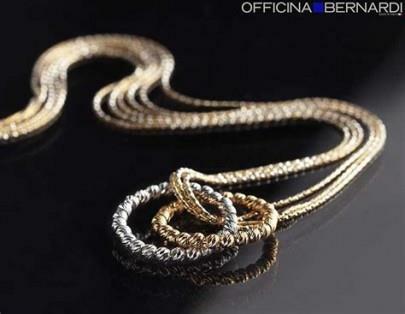 To learn more about the Officina Bernardi products currently available at Lewis Jewelers , contact the store directly by calling (877)-885-3947 or emailing . Since 1921, Lewis Jewelers has been the go-to source in the greater Detroit and Ann Arbor, Michigan areas for designer engagement rings , wedding bands , timepieces , fine fashion jewelry, and certified loose diamonds. Committed to their community, Lewis Jewelers is the proud supporter of University of Michigan athletics, The Kite Network, as well as the University of Michigan Children's Hospital, and many other local charitable institutions. For more information on events, sales, products, and fine jewelry services available at Lewis Jewelers, please check out their website at LewisJewelers.com, call (877)-885-3947, or visit their diamond showroom located in Ann Arbor, Michigan today.